Home » Reading Experience » Stand Up and Cheer Moments Part IV: Spider-Man is BACK! When Peter Parker’s Uncle Ben died in the origin story of Spider-Man (Amazing Fantasy #15) because Peter earlier in the story willfully failed to apprehend the criminal who went on to kill his Uncle – the ultimate lesson Parker learned was that with this great new power he received from a radioactive spider bite, it was his responsible to use these incredible abilities for the force of good. 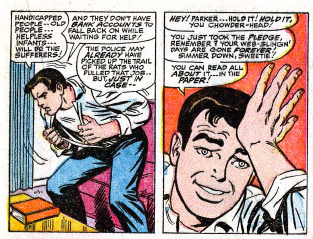 But throughout the series, Peter has continually acknowledged how hard it is for him to be Spider-Man. He lives a life that is now centered around a great deal of sacrifice – whether it’s his social life, or his family life with his Aunt May. Despite what is acceptable from a social perspective, Peter routinely has to choose being Spider-Man over convention. And with his superhero alter-ego and deeply hidden secret, there’s not even anyone out there who can provide a real shoulder to cry on for Peter. Which is why Amazing Spider-Man #50 is such a powerful story to me and the fourth and penultimate entry in Chasing Amazing’s “Stand Up and Cheer Moments” series. Leading up to this issue, which is best known for it’s iconic “Spider-Man No More” cover, the idea of just “quitting” Spider-Man had crossed Peter’s mind on a number of occasions, but he never had the stones to totally up and do it. However, now that he’s in college, a perfect storm of personal melodrama for Peter came together – his grades were declining, his Aunt’s health was failing, the girl of his dreams – Gwen Stacy – was showing interest but he just didn’t have the time to go out with her. Then of course there was newspaper publisher J. Jonah Jameson, a constant thorn in Spidey’s side since day one, who was more relentless than ever before with the attacks on the web slinger. Peter was so defeated, he finally decided the time had come to give up on being Spider-Man. At first, it seemed like a great idea. He’s got Gwen and Mary Jane fighting for his affections and Jameson is patting himself on the back and celebrating Spider-Man’s demise – even hanging his discarded costume up in his office. But Peter’s innate sense of moral justice takes over. Just as Spider-Man quits, a new criminal mastermind, Kingpin, starts making a move on the city. When Peter hears about the crime spree, his first impulse is to get out of his street clothes and into his Spidey suit to take care of business. Of course his Spidey suit is now hanging up in Jameson’s office, so that’s impossible. Peter’s breaking point comes when he’s walking by a building and a group of thugs are attacking a security guard – a nice old man, who Peter can’t just leave there to be seriously hurt or killed. Despite not being in costume, Peter, takes care of the criminals and saves the old man, who he realizes reminds him of his deceased Uncle Ben. This heroic act reminds Peter of how he failed his uncle and how he’s ultimately responsible for his death. Peter understands that for the sake of innocent people everywhere, he HAS to be Spider-Man. Otherwise, he may end up with more blood on his hands. That’s when he sneaks into Jameson’s office, steals back his suit and declares very defiantly that he’s “Back.” It’s a moment that despite reading it 50 or so times over, and seeing it adapted in the Spider-Man 2 movie, STILL gives me chills to this day. It’s a moment that helps us understand just how relatable and human Spider-Man is. During the current Spider Island story arc, in ASM #672, Mary Jane tells Peter that it’s not being Spider-Man that makes him special – it’s being Peter Parker. It’s a fantastic moment that I like to think harkens back to stories like ASM #50 for its heart and soul. 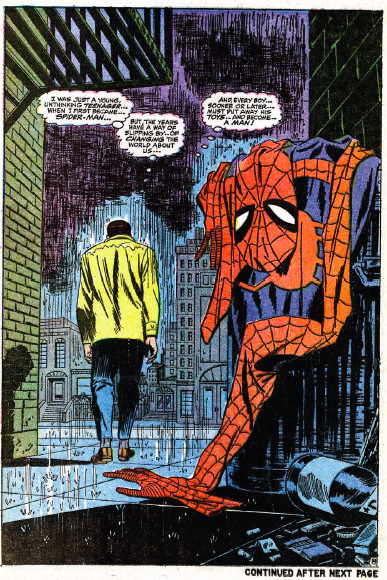 Stan Lee and Steve Ditko (and later John Romita) have created such a complicated character in Peter Parker – even though as a fan I love Spider-Man, I can totally understand why Parker wants to give the double life up and just live a normal existence as a college kid. And when he realizes that he has to push on as Spider-Man, your heart partly breaks for Peter, but also fills up with pride because he’s able to come to that conclusion on his own. During his day-to-day life, Peter may not think that anyone holds him up on a pedestal, but behind the fourth wall, millions of readers love the guy specifically because of the kind of human being he is, not the superhero he is. 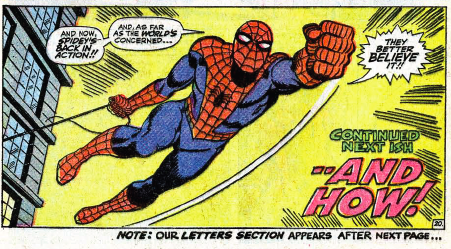 It makes me realize that in ASM #50, that last moment when Spider-Man is “back,” I’m not actually cheering for the hero. I’m cheering for Peter. Because he’s already been on a long emotional journey, yet he still always ends up doing what is right for the greater good.